Collecting is a side effect of an insatiable obsession. Does anyone think Richard Pearson will cease obsessing over eggs or collecting them when he's released from prison? 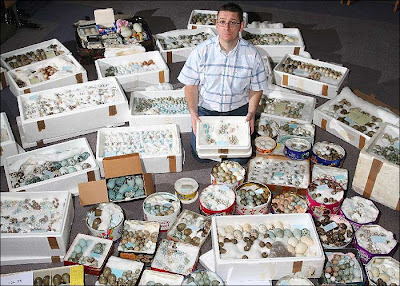 When police raided the home of Richard Pearson, they found one of the largest egg hauls ever recovered. More than 7,000 eggs, including 653 belonging to the UK's most protected species such as a red-necked phalarope, were discovered in his Cleethorpes family home. Officers also found 59 dead birds in a freezer in his garage and dozens of diaries detailing where and when he had found the eggs. They seized equipment such as a rubber dinghy, waders, climbing spikes, syringes, cameras and sat-nav systems, all used to amass such a huge collection over a 20-year period. Pearson, 41, was sentenced to 23 weeks in prison.